2 Why Minitab needs to have three different data types? 3 How to change one data type into another? 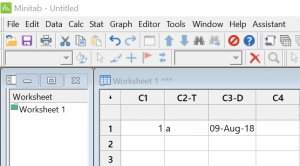 There are three different data types in Minitab. These data types are Numeric, Text and Date / Time. Following picture depicts these data in columns C1, C2 and C3 respectively. Numeric – it includes all numbers including the currencies. Please refer column names in the adjacent image. C1 does not have any suffix, while C2 is represented as C2-T and C3 is represented as C3-D. Therefore, please note that numeric data type does not have any suffix in column names. Text – It includes all alphanumeric characters. Any column number with text data will get suffix as T e.g. as Column 2 has text data it will appear as C2-T. Date / Time – It includes most of the date (e.g. 23-Apr-18) and time (e.g. 2:30) formats. Any column number with date/time data will get suffix as D e.g. in Column 3, which has date/time data, appears as C3-D.
Why Minitab needs to have three different data types? Statistics define only two types of data viz. continuous and discrete where as Minitab classifies data into three categories viz. numeric, text and date / time data. The reason for different approaches of data classification is due to an interesting limitation. In certain conditions, continuous data behaves like discrete, while in other conditions discrete data behaves like continuous. in nature as they are measured using some instrument, which converts characteristics into a number. But when values are very close to Least Count data behaves like discrete. In such conditions, analytics have to be done like discrete data. as they are usually classifying defectives or counting defects. Discrete data in classification form (e.g. pass / fail) will always remain discrete while those expressed in counts can behave like continuous. For example for very large values e.g. count of product in 2000 - 3000, the discrete data behaves like continuous data. To avoid this ambiguity, if we classify data in numeric and text, it gives us flexibility to choose type of analysis we want. How to change one data type into another? Minitab allows to change data type from one to another using command line Data>>change data type. Details are given in separate article to be published soon. Sanjeev is co-founder of Leandigit and is Six Sigma Master Black Belt with specialization in DMAIC, Lean and Transactional DFSS with over 22 years of industrial and consulting experience. Lead companies to win prestigious Deming Award, RBNQA, CII-Exm Bank, RGNQA, IMEA etc. He is also a senior examiner for National Quality and Manufacturing Excellence Awards.